Template Monster is a world leader in e-commerce – providing customers with valuable, convenient, relevant and enjoyable online experiences through a diversity of products and services. The main orientation of the company is web design with an emphasis on affordable web design products and services for WordPress, Joomla. 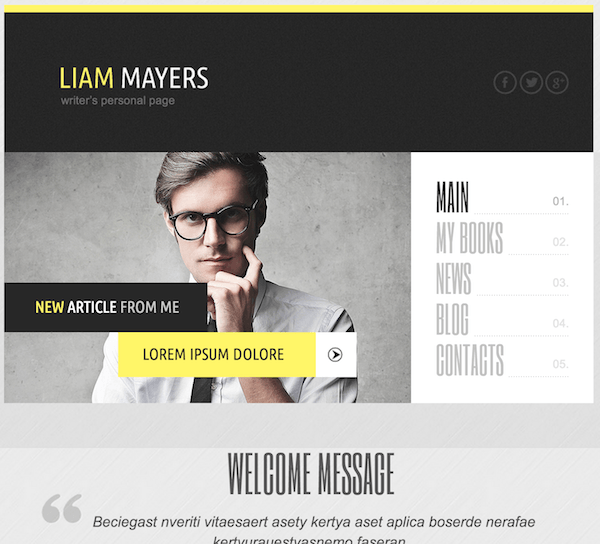 They pioneered in creating and selling high quality website templates. Their library is currently the largest on the Internet, with over 20,000 website template designs. Also they add, on average, 450-500 new designs monthly. What Themes Does Template Monster Have? E-Commerce Templates, CMS Templates , Corporate Templates, Personal Template, Video Templates, etc.. I got time to play with Bootstrap Cherry Framework Theme yesterday and I’m very impress with the layout and flexibility it has. Some info on that: To make people interested in you, share more information with them via personal page. The contemporary design in attractive black and yellow colors will help perform it effectively. Your creativity will be underlined with this modern design that stands out due to the original typography that can present your ideas in the most favorable light. The easy-to-use menu in the right side and back to top button make the navigation comfortable. Each graphic element and each coloring of the text speaks for the unique design of this theme and your personality. I’m very impressed with the variety of themes on TemplateMonster.com.. Established in 2003, the company proved to be a reliable retailer of quality web design products whose library counts over 20,000 templates with 450-500 new designs added monthly. Besides the ready-made themes, TemplateMonster also offers different web design services, such as template customization (in partnership with TemplateTuning.com), template installation, hosting services. 4 out of 5 rating. If you are interested in your Plugin/Theme review, contact us here.